오늘은 올리아빠를 다시 한국으로 모시고 갑니다. 장난이고요, 2년만에 한국 식당에 모시고 갔어요! 그런데 아무 식당에나 갈 순 없죠. 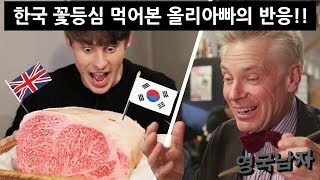 그리고 이번에 알고보니까 올리 아버님께 한 번도 한국 소고기를 소개해드린 적이 없더라고요 - 그래서 최근에 런던 중심지에 새로 오픈한, 손흥민 선수의 최애 한국 고깃집에 모시고 가서, 한국 밖에서 먹어본 한국 음식중에 제일 맛있었던 식사를 즐겼답니다. Today we take Ollie's Dad back to Korea. JK - but we did take him to a Korean restaurant for the first time in 2 years! And not just any Korean restaurant. We realised that somehow we never got the chance to introduce him to Korean style beef - so we took him to a relatively new Korean restaurant in London that is supposedly one of Son Heung Min's favourite restaurants, and had what was probably the nicest Korean meal I've ever had outside of Korea.